Pink Taxis were introduced a few weeks ago in Mexico City. They are driven by women and carry only female passengers or mothers with small children. The idea is to eliminate the sexual harassment and even violence some women passengers experience from male drivers. Women taxi drivers also suffer these abuses at the hands of male passengers. In 2009, there were 1300 reported cases of sexual intimidation in Mexico City taxis. Every day between 30 and 35 crimes are committed against drivers or passengers. Some taxi drivers have been implicated in “express kidnappings” which result in the passenger being robbed, being forced into withdrawing the maximum possible cash using their ATM cards, and having their loved ones deliver cash. After a few hours, the passenger is released, unharmed but many pesos poorer. The idea of special female-only taxis is not new. 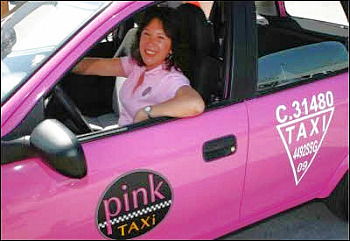 There have been pink taxis in Puebla since 2009. Furthermore, female-only taxis have been operating in many world cities for years, including: London, The Hague, Amsterdam, Barcelona, Moscow, Cairo, Damascus, Kuwait, Dubai, Tehran, Mumbai, and Dacca. In addition, female-only buses and metro (subway) cars have in operation in Mexico City and other major cities for many years. The pink taxis in most cities are labeled “Pink Taxi” in English, as well as in the local language. Their very bright “Pepto Bismol” color makes them very conspicuous. The ones in Mexico City are equipped with GPS systems and “panic buttons” which can alert the police headquarters if there is any emergency. They also come with mounted make-up mirrors. The taxis are mostly used at schools, hospitals, and shopping malls. There are a variety of opinions concerning these pink taxis. Many women passengers and taxi drivers think they are great; they make them feel much safer. Others think the pink color singles them out as vulnerable targets and could provoke increased sexual harassment or worse. Some men support the idea, especially for their taxi riding spouses and daughters. Other men think they are discriminatory. Government officials feel the new pink taxis support their legislative actions to reduce sexual harassment and domestic violence. Women’s rights and feminist groups generally think they are a move in the wrong direction. They will hinder efforts for full equality and stimulate more gender discrimination. Chapter 29 of Geo-Mexico: the geography and dynamics of modern Mexico is titled “Variations in Quality of Life within Mexico” and discusses many aspects of poverty, including Gender Inequality. Buy your copy today, or ask your local library to purchase a copy for their collection.